Whether your child has been diagnosed with an Autism Spectrum Disorder, ADHD, or another neurodevelopmental disorder (or you suspect that your child has some atypical developmental characteristics), you may feel confused and overwhelmed regarding treatment options. There are many different approaches that can be beneficial depending on your child’s specific symptoms and needs. It can be frustrating and challenging for parents to research all the options available, decide what to try, and then access the appropriate treatments. Diet –The types of food your child is eating has a major impact on all aspects of behavior and development. Many children have what has become known as the “typical American kid diet” of hot dogs, macaroni and cheese, chips, fries, etc. Not only is this diet setting children up for a variety of health problems, but it negatively impacts their brain development! Many children with autism and other neurodevelopmental disorders are picky eaters, and want to stick to certain types of food. It is important to expose these children to a variety of foods in ways that are comfortable for them so that they begin to expand their diet. Children with neurodevelopmental issues often have food sensitivities (such as gluten, soy, and casein) that contribute to their challenges. Getting appropriate food sensitivity testing by a health care provider, and removing from the diet foods that are creating problems, can have a significant impact on everything from behavior to communication. Supplementation with vitamins and minerals can also be an integral part of treatment for these children. Working with a health practitioner who is well versed in identifying and treating children with these issues is vital to identifying deficiencies, and treating them through supplementation and other biomedical approaches. Movement – Physical activity is vital for proper brain and body development. Children, especially, form vital brain connections through moving their bodies and exploring the world through their senses. It is critical, therefore, that children have the opportunity for physical movement throughout the day. Our culture tends to promote sedentary activities for children, such as watching television and playing video games. While there is certainly some entertainment value to these activities, choosing passive stimulation over active movement contributes to a wide variety of emotional, behavioral, and cognitive difficulties. For children with autism and other disorders, time spent on these sedentary activities needs to be very limited. Instead, emphasis should be placed on engaging in physical activities such as going for walks, playing on the trampoline, swimming, riding bikes, etc. Working with a specialist in sensory-motor processing can be very beneficial in identifying specific types of movement experiences that will enhance the child’s development. Parents can begin by providing basic movement activities at home in order to strengthen brain connections and improve overall development. Stress – High levels of stress are rampant in both adults and children today. Just as chronic stress takes a toll on adult mental and physical health, it takes a toll on child brain development as well. Children with autism and related disorders experience a significant amount of stress on a daily basis just by virtue of their disability. Add the stress that comes from overly busy schedules, family conflict, and homework, can be a recipe for disaster for these children. Parents must think about ways to reduce the stress in their child’s life, and ultimately their family’s life. Some simple ways to start include slowing down the pace of the daily schedule, providing the child some time for relaxation and reduced demands throughout the day, and addressing situations that create excessive stress. Sometimes it is very appropriate for parents to request less homework or reduced academic demands for their children, particularly during periods of high stress. Stress reduces the child’s ability to cope with and process even basic everyday activities. Working with a professional who is able to support parents in establishing calm routines for the family can be very helpful. Reducing stress in the lives of these children allows them to make more sense of the world around them, and supports their development in all areas. 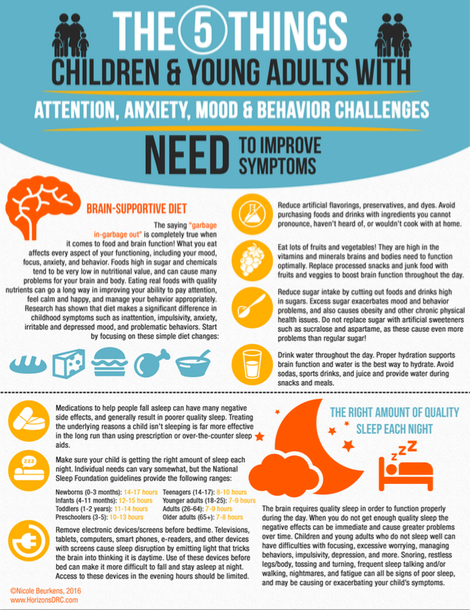 Sleep – Just as adults struggle with getting through their required daily tasks when they lack sleep, children also can have numerous functional problems when they are not sleeping well. Not only is good quality sleep important for allowing the brain to rest and integrate connections during the night, it is also essential for proper functioning throughout the day. Lack of sleep can lead to increased behavior problems, hyperactivity, learning challenges, and social disconnectedness. This is one of the first things that should be addressed for a child with developmental challenges. Parents should work with a health practitioner who can assist with identifying reasons for disrupted sleep and provide treatment options for addressing them. A medical sleep study, shifts in sleep routines, supplementation, and diet changes can all be components of helping a child attain better quality and length of sleep. Improving sleep paves the way for better behavior, communication, learning, and relationships throughout the day. Having a child with neurodevelopmental disorders provides numerous challenges for parents, not the least of which is knowing where to begin with treatment. Whatever options may be chosen, addressing the four areas of diet, movement, stress, and sleep is critical to best support a child’s ability to learn, communicate, socialize, and behave. Whether parents choose to work with professionals who can help them address these areas, or they develop strategies on their own, it is vital to investigate how these issues are impacting their child. Supporting a child’s diet, movement, stress level, and sleep are great ways for any family to start their child on the path toward better development.